RadCartesianChartView visualizes each data item from the ScatterPointSeries as individual points on the plot area. ScatterPointSeries like all other scatter series require two numerical axes to function propely. All scatter series are incompatible with all categorical axes. 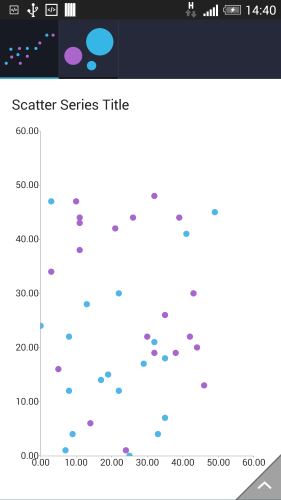 To create a chart with scatter series developers need to create a chart object, add horizontal and vertical axes and add a scatter series object populated with data. It must be noted that the chart must have a LinearAxis set for both the horizontal and vertical axes. Immediately below is the implementation of the initScatterData() method which is used to populate the scatter series with data along with the ScatterPoint class which serves as the actual chart data. After you create the method for initialization of sample data, you can create a RadCartesianChartView with ScatterPointSeries by adding the following code to the onCreate() method of your Activity. setStrokePaint(Paint): changes the color used to draw points' stroke. In order to get the current value, use getStrokePaint(). setFillPaint(Paint): changes the fill of the scatter points. In order to get the current value, use getFillPaint(). You can also customize the appearance of ScatterPointSeries by using Palettes.